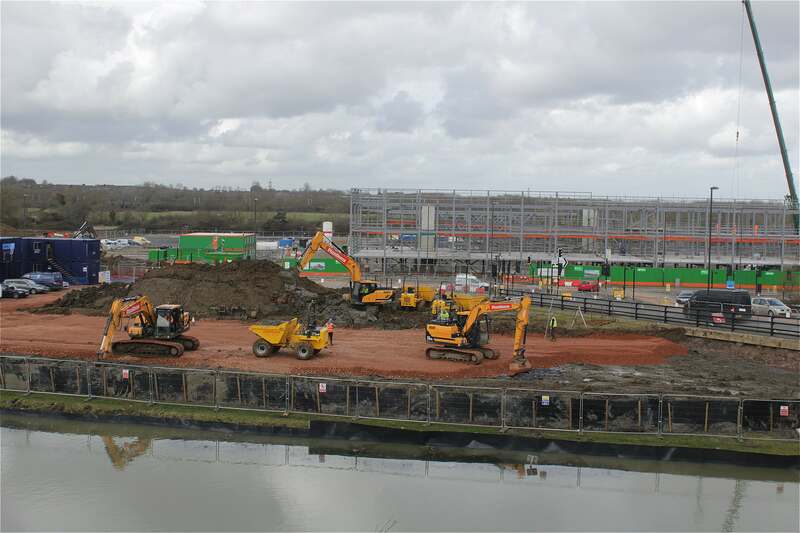 Foundations are being laid in Wichelstowe on a flagship Hall and Woodhouse café, bar and restaurant as the first phase of works to restore the Wilts & Berks Canal draw to an end, continuing the ongoing development of the Wichelstowe site. Spread along 200 metres of Canalside in Wichelstowe and simply called ‘Hall & Woodhouse’, the development will be an urban, all-day, multi-occasion café, bar and dining room. Work will continue throughout the rest of the year with an expected opening in early 2019. The first phase of the canal restoration works have come to an end with hundreds of cubic metres of clay being laid to reconstruct the canal banks and prepare the land for development. Hundreds of cubic metres of silt have also been removed from the canal bed which will make boat trips along the canal easier in future. The second phase of the canal restoration will be delivered by contractor Alun Griffiths and is due to commence next week. The first step will be to drain the water from the southern section of the canal alongside Waitrose ready for the bank improvements to begin. The water will be stored in adjacent ponds and the unaffected areas of canal until the works are complete and a specialist fish rescue company will relocate any existing fish. Cllr Toby Elliott, Swindon Borough Council’s Cabinet Member for Planning and Sustainability said, “It’s great to see further progress at Wichelstowe following our announcement in January of the agreement with Barratt Developments to build a further 2,750 new homes on the site.